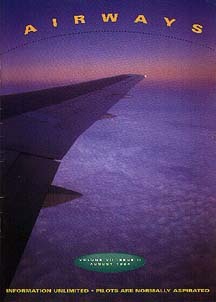 This 'Airways' magazine cover shot was taken on a flight from New York to London with a Pentax LX 35mm camera and Pentax 24mm lens. Unfortunately, a burglary a couple of years ago left me camera-less (with a medium format Pentax 645 kit also being taken). When it came to replacing the gear, I decided to change to Nikon 35mm gear (the F4s) and a Pentax 67 medium format kit. This was because the Nikon system better suits my needs, and 67 provides just that little extra gain over 645 in image area. Both have proved to be excellent reliable, high quality cameras with an excellent (Nikon) and good (Pentax) range of top-quality lenses. For digital work, I again use Nikon's gear. Need someone for a photography assignment, or looking for stock? E-mail me now for more information.